This post of mine originally appeared on the Scientific American guest blog some time ago. Considering it has been three years, and it’s always been one of my favorite pieces of writing, I thought it was time to “bring it home” to Skulls in the Stars. Paris has long had the nickname “The City of Light,” due to its role as a center of education during the Age of Enlightenment and, in the 1800s, due to its early implementation of electric lighting. It very nearly had its name associated with another form of radiation in 1910, however, thanks to a truly unique experiment performed in the most iconic spot in the city: the Eiffel Tower! The experiment, which was the first significant evidence of the existence of cosmic radiation, also highlights the challenges scientists experienced in the early 20th century and the ingenuity they used to overcome them. The early 1900s was a period of intense interest in radioactivity. The phenomenon was discovered in 1896 by Parisian researcher Henri Becquerel in what can only be described as a serendipitous find. Becquerel specialized in the study of phosphorescence and fluorescence, and wondered if such “glow in the dark” materials might give off X-rays, which had themselves only been discovered the year earlier. Becquerel wrapped photographic plates in black paper, placed a sample of phosphorescent uranium potassium sulfate on top of it, and placed it in the Sun. As he expected, the photographic plates were darkened, suggesting the presence of X-rays. When poor weather forced him to put his experiments on hold, however, he found that the uranium still darkened the photographic plates, suggesting the presence of some sort of inherent radiation coming from the uranium itself! Becquerel’s discovery didn’t attract much attention at first, being overshadowed by the more sensational properties of X-rays. 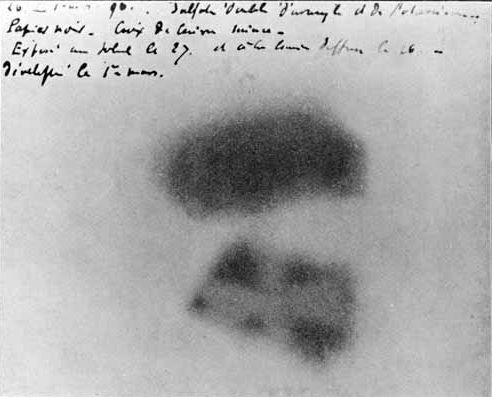 This changed with the investigations of Marie Curie, who found a number of new radioactive elements. Around 1898, she demonstrated that the known element thorium was also radioactive, and in the same year she and her husband Pierre crushed hundreds of kilograms of uranium ore to isolate the new radioactive element polonium. Their investigations suggested an even more radioactive element in even smaller quantities, and within a year they had proven the existence of the highly radioactive radium — though it took until 1902 to collect even a tenth of a gram of this new substance. With the discovery of radioactivity also came an awareness that radiation was, to some degree, found everywhere. Electroscopes, devices designed to store and measure electric charge, were found to slowly lose that charge, regardless of how well they were insulated. 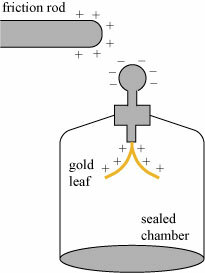 A simple form of electroscope is a gold leaf electroscope, illustrated to the left. When a positively-charged friction rod is brought near the device, the negative charge in the gold leaf is drawn towards it, leaving the leaves with a net positive charge. The positively-charged leaves repel, giving a rough measure of the strength of the induction. Touching the friction rod to the electroscope draws away all the negative charge and leaves the scope with a net positive charge. Even well-insulated electroscopes will gradually lose charge due to the bombardment of external radiation. The radiation ionizes the air within the device, and the free charges are drawn to and neutralize the charge on the leaves. For researchers, the next natural question to ask was: what is the origin/nature of this external radiation? The obvious conclusion was that it came from radioactive materials within the earth, but it was not exactly clear from where it originated. Also, the possibility of radioactive emanations from above, though seemingly unlikely, could not be discounted. These mysteries drew the attention of Professor Theodor Wulf (1868-1946), a German born physicist and Jesuit priest who lectured at the St. Ignatius College in Valkenburg, Holland. All accounts suggest that he was a talented scientist, and he even studied at the University of Göttingen under the supervision of the distinguished chemist Walther Nernst, who would eventually win the Nobel Prize in Chemistry in 1920, “in recognition of his work in thermochemistry”. In the course of his studies, Wulf noted that the electroscopes in use were not precise enough to carry out detailed ionization experiments, and furthermore the delicate gold leaves were easily damaged when moving the device, making it a poor choice for studies in the field. To solve these issues, in 1907 he designed his own “dual thread electrometer”, which became known as the “Wulf electrometer” and was quickly employed by many researchers performing delicate ionization experiments. The Wulf electrometer uses, in place of gold leaf, two quartz threads coated with platinum. When charged, they bow outwards, as shown in the figure, and their separation can be very accurately measured with a microscope, in turn providing a very accurate measure of the charge remaining on the threads. A screw “A” at the top of the device allows one to rotate the threads to be maximally visible to the microscope; for ease of transport, the bottom of the threads is weighted and loosely coupled to the bottom of the (metal) container. The protruding cavity in the lower right corner of the chamber evidently contained sodium, to draw off any excess humidity that might prematurely discharge the device. Of course, the device could also lose charge by means other than radiation, simply by virtue of it not being perfectly isolated from the outside environment. 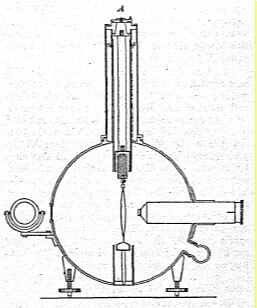 To measure such “isolation errors”, Wulf had an additional vertical cylinder inserted into the chamber (held by screws “S”) that could be slid over the wires. This would essentially protect the wires from the gas ionized by radiation, and any losses that occurred were presumably due to other inherent weaknesses in the system. Wulf took his electrometer and made measurements of the inherent radioactivity in a variety of diverse locations, including high above sea level near the town Zermatt, Switzerland (in the shadow of the Matterhorn), in chalk mines near his home in Valkenburg, and in the Caves of Han-sur-Lesse in Belgium. For the most part, the measurements, though they showed great variability with location, suggested that the measured radiation was coming from the ground. Some tantalizing clues suggested otherwise, however. In one of his experiments, Wulf placed his electrometer into a snugly-fitting pool of water. With the top of the device blocked with a meter of water, he saw a slight decrease in ionization loss, suggesting that radiation from above must contribute, albeit weakly. Furthermore, in 1909 reseachers Gockel and Bergwitz independently did measurements of radiation at high altitudes from a hot air balloon. If radiation was coming entirely from the ground, one would expect that it would decrease in intensity dramatically with height, being absorbed by the atmosphere. Gockel measured a surprisingly small decrease, suggesting atmospheric radiation, while Bergwitz measured a large decrease, suggesting none. However, the nature of ballooning meant that the measurements were necessarily of short duration (and often dangerous); because it was well-known that radioactivity varied on a daily cycle, and was subject to weather conditions, the results were questionable. Also, the motion of the balloon meant that the altitude and location of the balloon during measurements was uncertain. A stable high altitude platform was evidently needed to get to the bottom of the mystery. Fortunately for Wulf, he lived within a half-day’s travel of the undisputed tallest building of the world at the time: the Eiffel Tower. It will be moreover a wonderful meteorological observatory, whence the direction and the force of atmospheric currents can be usefully studied, from the point of view of science and hygiene, as well as the condition and the chemical composition of the atmosphere, the amount of electricity and moisture it contains, the variations of temperature at different heights, atmospherical polarization, etc. It is specially adapted for an astronomical observatory; for the purity of the air at this great height baout the low-lying mists, which so often cloud the horizon of Paris, will allow a number of observations often impossible in our climate. I will not weary my readers with the enumeration of all the experiments to be made on the tower, of which a programme has been already drawn up by our scientific men, and which include the study of the fall of bodies through the air, the resistance of the air to varying velocities, certain laws of elasticity, the study of the compression of gases of vapors under the pressure of an immense manometer of 400 atmospheres, a new realization on a great scale of Foucault’s pendulum demonstrating the rotation of the earth, the deviation toward the East of a falling body, etc., etc. ; lastly, a serious of physiological experiments of the deepest interest. I may even go so far as to say that there are few scientific men who do not hope at this moment to carry out, by the help of the tower, some experiment connected more especially with their own investigations. Eiffel’s worries didn’t end when the fair opened, either: the initial contract specified that the tower was to remain standing for twenty years — until 1909 — and then be torn down. It earned a reprieve until 1915 due to its perceived scientific and military applications, the latter being its use as a tower for the new-fangled wireless telegraphy. When World War I broke out in 1914, the tower became an important broadcast and monitoring station, and its safety was almost assured . Before that, experiments helped justify its existence. Eiffel himself used the tower as a platform for aviation and wind experiments, and his weather station would prove useful for Wulf’s experiments. French astronomer Pierre Jules César Janssen used the searchlight at the top of the Eiffel Tower to demonstrate that the spectral lines of oxygen found in the sun’s rays were purely of terrestrial origin. Not all experiments went as planned, however. 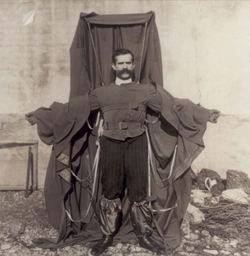 In 1912, Austrian tailor and parachute pioneer Franz Reichelt earned permission to test his prototype “parachute suit” on a dummy dropped from the tower. On reaching the top, however, he instead tested the suit himself, which failed to open, and he plummeted to his death. Theodor Wulf had a much more reasonable research program in mind. Getting permission to do radiation measurements at the Eiffel Tower with the help of French colleagues Jules Violle and Paul Langevin, he planned a four-day series of measurements at the top of the tower over the Easter week of 1910. 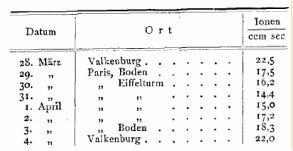 Those measurements were bracketed by a pair of measurements at the foot of the tower, and those in turn were bracketed by measurements in his home Valkenburg. The results were published in the journal Physikalische Zeitschrift in 1910 , and the main data are presented in the figure below. The results of Wulf’s radiation measurements at the Eiffel Tower, reproduced from . The attempts made so far therefore require either, excluding the earth’s crust, another source of gamma-rays in the higher layers of air or a much weaker absorption in the air than is previously thought. What Wulf had done was provided the first significant evidence for the existence of extraterrestrial radiation, now referred to as cosmic rays. Cosmic rays are particles, usually individual protons, that enter our atmosphere at ultra-high energies traveling at very near the speed of light. The term is used to loosely group together extraterrestrial particles from a variety of sources, including those ejected from the sun as well as those that come from elsewhere in our galaxy, and even beyond. 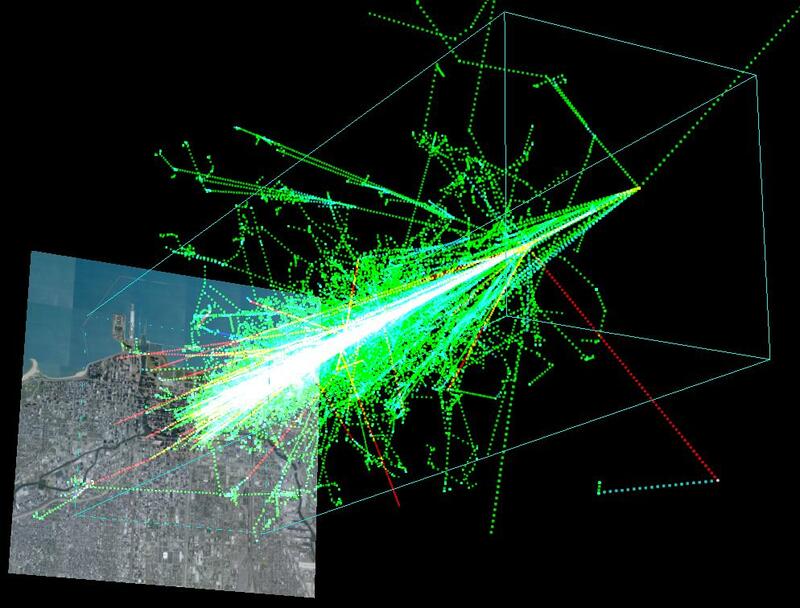 The exact origins of cosmic rays is still a matter of some debate, though the accepted hypothesis is that they are ejected from supernovas and propelled to high energies by the accompanying shockwave and magnetic field. The original (primary) cosmic rays are hardly ever observed on earth. The high-energy protons collide with molecules in the upper atmosphere and give birth to a cascade of secondary particles in what is generally referred to as an air shower. These air showers include a variety of elementary particles, including pions, gamma rays, and muons, the latter of which are most likely to survive to be detected at the surface. It is these muons that Wulf and others were detecting in their experiments. Alas for Wulf, his discovery seems to have attracted little attention and was mostly discounted in his time. In 1912, Austrian physicist Victor Hess undertook a series of high-altitude balloon experiments, in which he found that the radiation intensity increased from 1 kilometer upwards, and was several times the ground level intensity at 5 kilometers high. Also, he measured the radiation levels in a balloon during a solar eclipse and found that they did not appreciably decrease; this suggested that the cosmic rays were mostly coming from a source other than the sun. In 1936, Hess was awarded the Nobel Prize in Physics for the discovery of cosmic rays, sharing the prize with Carl Anderson, the discoverer of the positron; Wulf was nowhere mentioned. It is natural to wonder why Wulf did not get wider recognition for his experiment, which gave evidence for cosmic rays years before Hess. 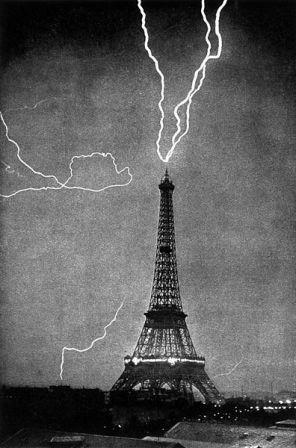 Putting aside the inevitable politics that is involved in Nobel decisions, Wulf’s experiment may have been hamstrung by the uniqueness of the Eiffel Tower itself. As the tallest building in the world and one of the largest metal structures in the world at the time, Wulf himself admitted that he could not discount the possibility that the tower was attracting radioactive materials to itself by some previously unknown phenomenon. Furthermore, as his quote above indicates, he also could not dismiss the possibility that the radiation from the ground was being absorbed less by the air than expected. Hess’ measurement of an increase in radiation at altitude was unambiguous evidence for the direction of the radiation. In any case, Wulf’s discovery heralded the opening of a new field of experimental research — what better place for it to happen than on a tower that heralded a new era of architectural ingenuity? T. Wulf, “Über die in der Atmosphäre vorhandene Strahlung von hoher Durchdringungsfähigkeit,” Phys. Zeit. 10 (1909), 152-157. G. Eiffel, “The Eiffel Tower,” in Annual Report of the Board of Regents of the Smithsonian Institution, 1890, 729-735. An excellent history of the building of the tower and the 1889 World’s Fair is J. Jones, “Eiffel’s Tower” (Viking, 2009). T. Wulf, “Beobachtungen über die Strahlung hoher Durchdringungsfähigkeit auf dem Eiffelturm,” Phys. Zeit. 11 (1910), 811-813. Title translates loosely to: “Observations of the radiation of high penetration capacity on the Eiffel tower”.